This is probably one of the easiest cakes you'll ever make; seriously, it's all made in one bowl and takes 25 minutes in the oven. Even better, it tastes great. It's light, delicately sweet, super moist, and slightly citrusy. The texture is definitely cakey, which is surprising considering the batter contained no butter, there was no creaming involved, and it's not ingredient-heavy. But I think it's the yogurt and oil that give the cake its wonderful texture. I almost skimped on making the orange "salad" that's to be served with it, but I'm glad I didn't. I figured this was just sort of a garnish, but it really makes the cake more of a complete dessert. I had trouble with my cheapie zester and couldn't zest strips from an orange to save my life, so I just grated the entire thing and added that to supremed orange segments. 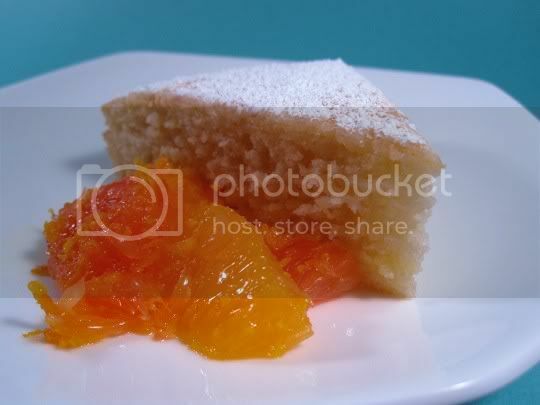 A little extra sugar makes this a sweet and juicy addition to the cake, and the zest gives the mixture a heavy citrus flavor and slight bitterness. Make again? Yes. Anything as orangey and tasty (and easy!) as this is fine by me. Vegan variation: Use soy yogurt and egg replacer.